I'm having so much fun with my Library Roulette goal! Last week, I shared the first three books on my reading list. Today I'm sharing three more. I was amused when I discovered that 327 was International Relations. A bit of background... From the minute I started school until the beginning of high school, I wanted to grow up and become an elementary school teacher. I had a chalkboard in my childhood bedroom and a yardstick that I used as a pointer. My mom bought me discarded textbooks from the district office as gifts. I'd study the books, then I would make the neighborhood kids sit squeezed in rows in my bedroom and I'd teach them from the textbooks. I loved it. I'm pretty sure I was born to teach. When I entered high school, I decided that I would not be a teacher but would instead have a career in Food Science. I loved food and cooking and thought it would be a very interesting path to take. In my junior year, I took my first chemistry class (which I hated) and decided Food Science was out. When it was time to fill out college applications, I was heavily involved with 4-H Citizenship activities, including Model OAS (Organization of American States). Based on this one hobby, I applied to the University of California at Davis as an International Relations major. The IR major at UCD was made up of equal parts of political science, history and economics. I loved my history and econ classes (as well as all my general ed classes), but I didn't like the poly sci classes very much. It became painfully clear that International Relations was actually not something that interested me very much at all, and that I actually REALLY wanted to be an elementary school teacher (which, of course, I'd known most of my life). I decided to complete my IR major and added an Education minor. I got my teaching credential the following year, eventually got an MA in Education and spent 11 years teaching 4th/5th grade. People are usually very surprised to hear that my BA is in International Relations. I'm not all that interested in government or politics or foreign affairs. I am no longer fluent in the only other language besides English I've ever studied (Spanish). I would never consider moving outside of California and would never live in a major city. I'm not even a huge fan of traveling. I do, however, LOVE learning about other countries and cultures. So I wasn't sure what I was going to find in the 327 section of the library. Would it be more of the textbooks I really didn't enjoy all that much in college? Happily, the answer was no. There were many interesting books from which to choose. This one, a memoir about life as a CIA spy, jumped out at me immediately. I definitely wasn't assigned anything like that to read in college! The first half of Blowing My Cover: My Life as a CIA Spy was a fascinating look at the application process and training required to become a CIA Case Officer. I had never really given any thought about what it might mean to be a spy and what type of training would be necessary. The second half of the book focused on the actual job of spying and was also very interesting. I had a hard time setting the book down, as I was so curious what would happen next. Overall, I liked the book very much and definitely learned a lot. The ending wasn't what I expected (or necessarily what I wanted), but it was a fascinating memoir. When I was around 8, my mom went back to college for a degree in Library Science. I vaguely remember her studying, but I can't remember anything about her textbooks or other materials. I picture her doing a lot of typing (on a manual typewriter, of course). 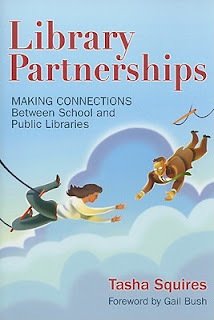 As I read Library Partnerships: Making Connections between School and Public Libraries, it occurred to me that those studying Library Science in 2013 must have a significantly different curriculum than my mom did around 1980. The book was full of wonderful suggestions about how public librarians and school librarians can partner with each other. There are specific ideas and directions as to how to develop these relationships. While interesting, they weren't relevant to me as a reader, since I am not (and likely will never be) a librarian. However, about midway through the book, the author began discussing how and why librarians should forge relationships with teachers. Fascinating! In my years of teaching, it never occurred to me to create a relationship with a public librarian. I used the library for classroom materials constantly, but I never ordered class sets of books, or requested a set of themed materials, or alerted a librarian about upcoming topics of study. I never invited a librarian to do a booktalk in my classroom, nor did I ever promote library events, or offer extra credit to those who attended one. Talk about missed opportunities! My only real criticism of this book is that can be tedious in its attempt to cover so many different situations. The author points out, for example, that a public librarian in a rural area with a bookmobile will have a different relationship with the one English teacher at the only local middle school than will a public librarian in a large city with many schools served by one library. The needs and circumstances are so different that the book sometimes struggles to address such a large spectrum of needs. Still, I applaud the effort to be so inclusive. Recommended: Yes, if you are a librarian or a teacher. Otherwise, no. Studies come out all the time telling us, definitively, that this is what we should eat, how schools should be run, how best to treat cancer, or how we should raise our kids... and then another study comes out telling us exactly the opposite. It's hard to know what to believe and who to trust. 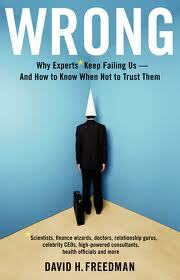 Wrong: Why Experts Keep Failing Us and How to Know When Not to Trust Them looks at why we shouldn't necessarily trust experts and why and how they mislead us. Chapters include: "The Trouble With Scientists," "The Idiocy of Crowds," and "Experts and the Media," to name a few. The material is interesting and detailed, with many specific examples of why we can pretty much count on experts to be wrong a majority of the time. Overall, I found the material interesting but depressing. While it may be true that most experts are wrong most of the time, I didn't enjoy being reminded of that for almost 300 pages. My favorite part of the book was Appendix 4: "Is This Book Wrong?" I really appreciate the fact that the author is not only open to the possibility that he is wrong, but embraces the fact that there is almost certainly material in his book that is wrong. Those first two sound really interesting!!! Boy you are brave allowing other people to pick your reading material. I couldn't do that since when I read it's purely for entertainment value so I need to make sure I am truly interested in the topic. Although the books you are reading are not the type of books I would read, I applaud your efforts!! The last book sounds interesting though. I have always thought the same way about the so-called experts... we're told different things from these different people almost on a daily basis so who do you believe? Maybe I missed it in your blog post, but did you get an "answer" to that question? No, the book talked mainly about when NOT to believe an expert without really addressing when you CAN believe one. Okay. Definitely not books I would pick on my own. But way to go on checking them off your list! I would read the first one, not the last two. You're definitely having an adventure with this library roulette. Very cool, Cindy! You have picked quite a collection! I love how you are reviewing them for us!!!! !